January 25, 2019 11:19 am. The final Road to the Kentucky Derby series prep for the month of January is Friday’s $150,000 Smarty Jones, the opening day feature of the 2019 meet at Oaklawn Park. The one-mile Smarty Jones is a lead-in to Oaklawn’s other Kentucky Derby preps: the Southwest (G3) in February, the Rebel (G2) in March, and the Arkansas Derby (G1) in April. Derby qualifying points of 10-4-2-1 will be awarded to the top four finishers. Hall of Fame trainer Steve Asmussen has never won the Smarty Jones, but has numbers on his side with three of the nine entries. Most prominent of these is Long Range Toddy, who earned 10 Derby qualifying points following an 18-1 upset of last month’s $400,000 Springboard Mile at Remington Park. Bankit, second by a head in the Springboard Mile following a stakes win against New York-breds at Belmont Park, re-opposes stablemate Long Range Toddy here. The trio of Asmussen trainees is completed by Boldor, who traded decisions with Super Steed in two starts in Kentucky last fall. Front-running Gray Attempt will try to stretch his speed beyond six furlongs for the first time in the Smarty Jones. The Jinks Fires pupil exits a one-length decision in the $74,250 Sugar Bowl at Fair Grounds. Finishing second and third, respectively in the Sugar Bowl were Manny Wah and Hog Creek Hustle, both of whom placed in the Lecomte (G3) at Fair Grounds last weekend. Super Steed was only fourth in the Sugar Bowl as the even-money favorite, but the Larry Jones charge showed great promise at Churchill Downs last fall breaking his maiden by six lengths in a first-level allowance. Super Steed is by 2010 Kentucky Derby hero Super Saver. Also in the mix are Six Shooter, up the track in the Springboard Mile but a rebound winner of the $75,000 Big Drama at Delta Downs last time. 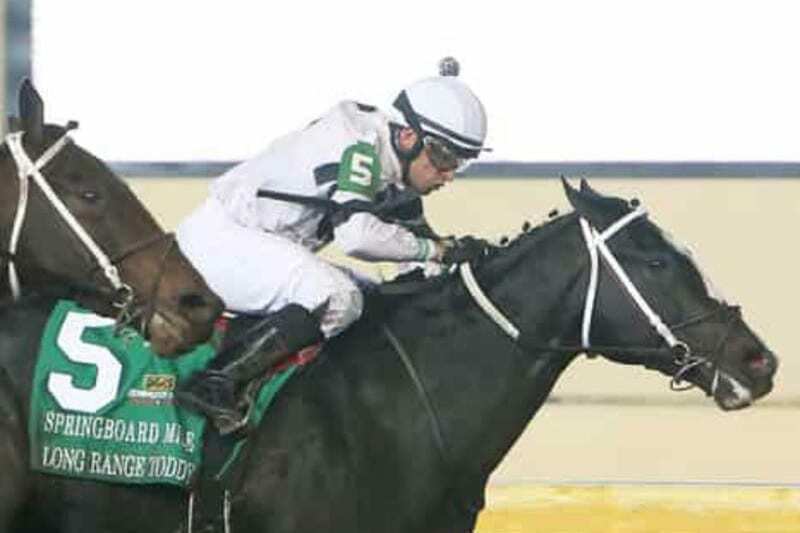 Forloveofcountry captured a one-mile allowance in the slop at Churchill in his most recent outing, while Sleepy Eyes Todd captured his debut at Remington Park in October at odds of 29-1. A sentimental choice in the Smarty Jones is Jack Van Berg, named in honor of the late Hall of Fame trainer who won two Oaklawn training titles in 1983-84. The maiden-winning colt is trained by his son Tom Van Berg. In 11 previous runnings, the Smarty Jones has been won by champion three-year-old Will Take Charge, Breeders’ Cup Dirt Mile (G1) winner Caleb’s Posse, and multiple Grade 1 winner Flat Out. It will be the eighth of nine races Friday with a scheduled post of 4:52 p.m. (EST).